For intense activity and extreme conditions, the Pump HD Sportbuds delivery crystal clear audio while providing IP67 waterproof/dustproof protection. Move with complete freedom and confidence during rigorous workouts and activities. 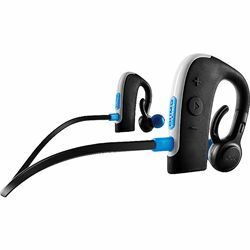 Since they're Bluetooth, you don't need to worry about about wires, but you can still control volume and playback with controls behind your ear. Includes noise-isolating comfort tips, noise-permitting tips, stabilizers, cable zip and charge cable. Requires USB charger or computer to recharge.